10X & 15X Eye Piece. 10X & 45X objective (Spring loaded), Dust cover & ply box. Specifications same but with LED Super white bright light with battery back-up of 7 to 8 hour. Mirror attachment for drawing of anatomy and Histopathology Slides. - Observation Head : Binocular head is equipped with standard 450 inclined observation tubes, rotatable through 3600 and can be fixed in any direction with clamp screws, interpupillary distance from 53 to 75mm & diopter adjustment are provided. - Optics Fitted with our time tested DIN Achromatic Objectives, designed as per Ferman Standards of Optical Excellence. - Body : Nicely designed, die casted body, sophisticated enough to fulfill your microscopy needs. The incomparable collection of features includes separate fine and coarse control. - Binocular Head inclined at 45 degree and rotatable through 360 degree with very fine antifungal prisms. Stand: Heavy round base of solid construction. A microscope is an instrument for viewing objects that are too small to be seen by the naked or unaided eye. The term microscopic means minute or very small, not visible with the eye unless aided by a microscope. 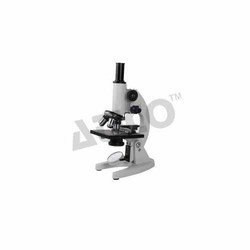 We are engaged in manufacturing, exporting and supplying a very comprehensive range of Institutional Traveling Microscope. Our range is highly appreciated by the clients and available at market leading prices. Similar to Cat. No. 6050 but with detachable mechanical stage. Achromatic objective: 4x/5x, 10x, 40x/45x & 100x Oil immersion. Eyepiece: 10x WF or 15x WF Magnification: 40x to 1500x. 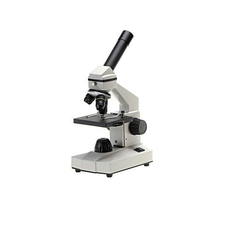 Available with us is a wide range of Laboratory Microscopes. These are used to get a magnified image of details of small objects, which are not visible from naked eyes. Our microscopes are used in a variety of Laboratories, Research Institutes and others.